Response to New York Times Op-Ed: The “Asian Advantage” is a myth. Plain and simple. Read National Director Christopher Kang's response to "The Asian Advantage" New York Times column on Medium. The “Asian Advantage” is a myth. Plain and simple. This is not just an “awkward” question, it’s an uninformed one that perpetuates stereotypes and divides Asian Americans and Pacific Islanders (AAPIs) from the broader racial justice movement. With respect to his column about Asian Americans and Pacific Islanders, unfortunately, Kristof is (to use the title of his provocative series on race last year) a white who just doesn’t get it. This may be true — as far it goes. But AAPIs are a very diverse population. While as a whole, 49% of Asian Americans have at least a bachelor’s degree, there are great differences within our community. For example, according to the Center for American Progress, nearly 40% of Cambodian and Hmong Americans have less than a high school diploma. The same is true for roughly 30% of Vietnamese and Laotian Americans and 19% of Chinese Americans. Furthermore, AAPIs are one of the fastest-growing populations in poverty since the Great Recession. According to the Center for American Progress, from 2007 to 2011, the number of Asian Americans in poverty increased by 37% and Pacific Islanders by 60% — compared to the national increase of only 27%. And while Asian Americans’ median household income may be higher than whites, the rate of senior poverty is 13.5% for Asian Americans and 12.1% for Native Hawaiians and other Pacific Islanders, compared to only 7.8% for whites. On some level, I sympathize with Kristof because there simply is not enough disaggregated data available to demonstrate the diverse realities and concerns of the AAPI community. This is why Governor Brown’s veto last week of Assembly Bill AB-176 was so inexplicable. This legislation would have required California’s publicly-funded universities and community colleges, as well as several state Departments, to update their reporting categories and disaggregate their data. Better data leads to better policy — and a more informed public discourse. It’s not surprising, then, that the California State Senate passed AB-176 unanimously, and that all but one Assemblyman in the California State Assembly supported it. What was surprising — shocking, really — is the Governor’s veto, especially given the significant bills he did sign over the weekend. Perhaps Governor Brown vetoed this legislation based on the same assumption underlying Kristof’s article — the myth that the AAPI community is so successful that we do not need access to government data or funding. 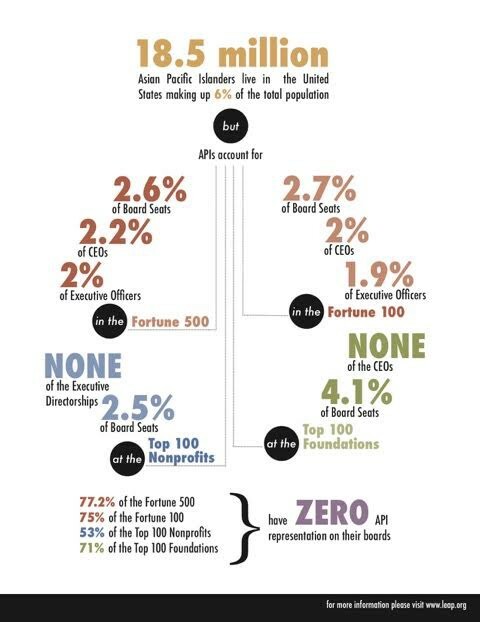 The same myth that has led philanthropic investments in the AAPI community to stagnate at just .3% of foundation investments for the past 25 years. The model minority myth. Kristof noted that “positive stereotypes create their own burden” but unfortunately, he only recognized this with respect to AAPI students. He is right — but must expand that same logic to his entire thesis. By promoting the model minority myth and the positive stereotype that AAPIs have been “so successful” and “disproportionately stars,” he creates burdens on our entire community — masking the real needs within our community and brushing away the discrimination and bamboo ceiling that we continue to confront. I want to reiterate that while I do not regularly read Kristof’s columns, I have read enough to find him very thoughtful and engaging. His series “When Whites Just Don’t Get It” was the kind of honest, frank, and thought-provoking reflection regarding race that we need more, not less, of. And so I don’t mean to be critical of him personally and don’t mean for this response to be about him because it’s not. In fact, I applaud the intent of Kristof’s column — to respond to those who would say that the age of discrimination is behind us because AAPIs have succeeded. It’s an argument that must be responded to because it is often used to suggest that other communities of color just aren’t working hard enough, have strong enough families, or enough passion for education (to use the three tributes that Kristof cites). He is absolutely right to respond to those who believe that achieving racial justice and equality is so easy. I guess my real disappointment is that Kristof purports to confront “head-on” the question “Does the success of Asian-Americans suggest that the age of discrimination is behind us?” But truly answering the question head-on would have been to attack both premises — not just whether the age of discrimination is behind us but also how and to what extent AAPIs have been successful, including the obstacles and discrimination we face. AAPI children are bullied for looking different or having unique customs and traditions. AAPI adults often face racial or religious profiling. One out of three AAPIs confronts a language barrier because they do not speak English fluently. Pacific Islanders have among the highest unemployment rates of all racial and ethnic groups. Society — and our government and philanthropic community — assume that we are so successful that we do not need access to additional services and that we do not even need the data to be counted. Our challenges may be different from those faced by other communities of color, but it would be a mistake to assume that even for AAPIs, the age of discrimination is behind us. Furthermore, by not fully exploring the premise of AAPI success and instead adopting the myth of the model minority, Kristof’s column unintentionally furthers the divide between AAPIs and other communities of color (a wedge that is not driven quite so unintentionally by some). The reality is that we’re all in this together. The goal of racial justice and equality is a goal that AAPIs have not yet achieved for ourselves — and we should not rest until it is achieved for everyone.